In the mid-19th Century, the American theatre was becoming slightly respectable. The way had been paved by the play version of Uncle Tom’s Cabin, which prompted some abolitionist ministers to actually encourage attendance instead of condemning all playhouses as Godless pits. Nevertheless, the word "theatre" still carried considerable baggage as a one-way ticket to perdition, so newly built entertainment palaces were called "museums," "opera houses," and in the case of Cleveland, Ohio "The Academy of Music." It was at the Academy of Music that a ten year old boy named Joe Haworth sat in the top balcony and saw his first play: The Count of Monte Cristo. He wrote later "I was greatly impressed by what seemed to me, on that occasion, the most magnificent place in the whole world." He was a local boy, the son of an Irish mother Martha O'Leary and an English father Benjamin Haworth, who was away working as a surveyor for the Union army. The same year that Joe found the theatre, he lost his father who died in a Confederate prison camp. As the oldest, Joe had to leave school and work to support his widowed mother, younger brother, and three sisters. He applied to the Academy of Music’s director John Ellsler for work as an actor. Ellsler offered him extra work, which Haworth turned down and instead got a job in a newspaper office. During those years, Joe became a popular guest in people’s homes because he would willingly entertain with recitations and songs. They didn’t have radio, TV, or phonographs in those days, but they had Joe. When Joe was 18, Ellsler relented and let him recite an epic Irish poem called "Shamus O’Brien" at a benefit performance. He got a huge ovation from the audience, and a rave review in the Cleveland Plain Dealer the next day. He was also spotted from the wings that night by an actress named Charlotte Crampton who was in residence at the Academy of Music that season. Crampton was an actress of considerable reputation, preparing to play the role of Richard III for Ellsler. She cast Haworth in the role of Buckingham and for that performance Haworth sold $500 worth of tickets, a good sum of money in 1873. John Ellsler’s company at the Academy of Music was one of the leading "Stock Companies" in America. Unlike contemporary "summer stock," they were major theatres that played full seasons with the leading actors owning shares in the theatre. Working for Ellsler was a well paid and prestigious engagement, and many of the best actors would either go to Cleveland for a full season or guest star with the company for three or four weeks. After Joe made a hit in Richard III, Ellsler gave him a position as "utility man" at ten dollars a week. For the next five years, Joe played all sorts of parts. 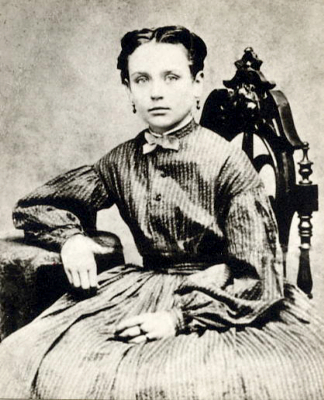 Charlotte Crampton became Joe’s teacher. She had starred opposite the two great acting rivals of early 19th Century America: the native born heroic Edwin Forrest and the subtle under-playing Englishman William Macready. This rivalry literally led to blood in the streets. Charlotte taught Joe the stage business of both these great stars, and equipped him to be able to pull off the classical style, as well as the muscular heroic school of acting. In his years at the Academy of Music, Joe acted with all the leading stars of the day. Among them was Fanny Januschek one of Europe’s leading actresses, who for a time acted only in German. By the time she performed in Cleveland she had mastered English and was billed as "The Queen of the English Speaking Stage". Another star he supported was Anna Dickinson, a famous lecturer who was attempting to extend her career into acting. She played in a vehicle about Anne Bolin called Crown of Thorns. After successful runs in Boston and Cleveland, she moved it to New York in April 1877, taking Haworth with her in the role of Cromwell. There she was roasted by the critics and it closed early. But Joe got his first taste of New York, and stayed on for a few months performing in support of Adelaide Nielson at Daly’s Theatre before returning to Cleveland. Edwin Booth played Ellsler’s theatre several times while Joe was working there. Joe played Laertes in Booth’s Hamlet, Cassio in Othello, and Edward IV in Richard III. Ellsler was sharing productions with a theatre in Pennsylvania at this time, so Joe and Edwin Booth toured there together and became very close friends. One night they got drunk in Booth’s dressing room and Booth told Joe he had "genius". When Joe repeated this remark to his Irish mother, Martha O'Leary Haworth replied: "It’s a very bad thing to have around the house." Joe also acted with Lawrence Barrett at the Academy of Music. 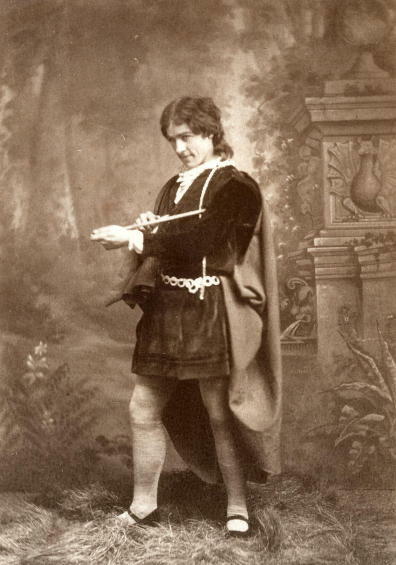 Barrett was a great classical actor, second only to Edwin Booth in esteem and popularity. One of Barrett’s great roles was Cassius in Julius Caesar and when he played the provinces, he had a habit of doing Antony’s "Friends, Romans, Countrymen..." speech in addition to his lines as Cassius. The actor assigned to the role of Mark Antony thought this was outrageous and refused to go on. An ill-prepared understudy was followed backstage from entrance to exit by Haworth who knew the part backwards, and coached him through the performance. Barrett noticed this and summoned Joe to his dressing room. He gave Joe a list of books to read, advised him to eat a lot of fish, and told him that he had a "future." "No young actor could have felt more pride in the appreciation of his abilities and merits than Joseph S. Haworth at his benefit last evening. The attendance was large, and the cordial and hearty manner in which he was received and treated was what he fully deserved. The play was Hamlet, and for one who has been upon the stage for so short a time it was an undertaking that few would have ventured upon. So far as our recollection goes Mr. Haworth is the youngest man who has attempted to enact the character of Hamlet in this country. Only a few of the greatest of our actors have made a success in this peculiar part, and the idea that Mr. Haworth might give the part was watched with great interest by his friends. His conception was not altogether original, but still in its main features it was not an imitation or copy of any of the great representations of the character of Hamlet. His reading of the lines was nearly perfect in elocution and had evidentially been studied with great care, as well as with a comprehensive idea of what the author intended to convey. He sometimes spoke too rapidly, but always with distinction, and his remarkably clear voice told with good effect throughout the entire play. He introduced some bits of "business" that were original, but we are not prepared to say they were not as legitimately correct as those of older and more experienced actors. He was a little too vehement and demonstrative in some of his scenes, but that was a minor fault. Taken as a whole, it was a wonderfully successful personation of the character for one so young in all the essentials of conception, elocution, and acting, and his friends had good reason to congratulate him on what he did and the bright future that is before him. He was called before the curtain several times, and was presented with baskets and bouquets of flowers from his former schoolmates and at the end of the play with an elegant ring from Mr. L G. Russell, of Crestline, who came to attend the benefit of 'Joe,' who was in his employ for some years before going on the stage. It was a neat and pleasant act on the part of the donor. Mr. Haworth leaves here for Boston with the best wishes for his future success, and the greatest confidence that he will win it even in the "Hub of the Universe." It was Joe’s final performance at Ellsler’s theatre which was now housed in the Euclid Avenue Opera House. His Ophelia was Ellsler’s daughter Effie. Joe and Effie were in love with each other, but marriage was not in the cards for either of them. So Hamlet was a farewell to his home, to his theatrical mentor, and to the object of his youthful ardor.